A neighbour found Rosella, a 32-year-old Filipina domestic worker, battered and pleading for help outside her employer’s home on November 9. However, she was taken back in by the employer, and not allowed out. Rosella outside the employer’s home the day she was rescued. A group of community workers then pursued the case and convinced the police to rescue Rosella from the home the very next day. The case against the doctor was first heard in court on November 13 and is now pending trial. Rosella recounted her ordeal to Migrant-Rights.org from the Temporary Shelter for Women in Kuwait City, where she is currently housed. “I arrived in Kuwait on February 26, and madam’s son-in-law took me home on March 2. When I first arrived there was a Sri Lankan and another Filipina working there. The Sri Lankan left within a few days of my arrival. I did not fully understand what the problem was, or who I was working for,” she says. The family told other maids that ‘madam’ had been sick in the hospital for 10 months and had only recently come back home. The ‘baba,’ Rosella says was ‘very good’ and his refrain every time ‘madam’ tortured the workers was to ‘ignore’. In June, just over three months since Rosella started work, the ‘madam’ hit Rosella with her fists and with the wooden handle of a knife, leaving marks on her back. The Philippine Overseas Employment Administration has mandated that all domestic workers working abroad should have a Facebook account so they can monitor their well-being. Right after she filed the complaint, Rosella ‘lost’ her phone. Chito, a social worker with Sandigan, a Filipino community group, says the agency informed the embassy of the complaint, but that Rosella’s case was lost among many others and was not followed up on. Through the months that she worked there, tortured and abused, Rosella had no clue that her ‘madam’ was already convicted in another case involving Vanessa, a domestic worker from Madagascar, and had only recently been pardoned following a 100,000 KD settlement. The family was beginning to feel pressure with both women complaining about mistreatment and demanding release from their work contracts. Chito believes the family was eager to send the workers back before a police case was filed. On November 2, the other domestic worker who had worked for the family for eight months was sent back. When the neighbour found Rosella, they also tried to send Rosella back. Sandigan and the Social Work Society (a Kuwaiti NGO) were keen to avoid this, as her repatriation would effectively absolve the family of their crimes, and filed a case against the employers. On November 9 things came to a head. The doctor was going out and asked Rosella to clean her daughter’s room. That’s when the employer became viciously violent. Rosella refused, insisting she would show ‘baba’ the abuse when he returned. Terrified, Rosella dashed out of the house, on to the main road and tried flagging down a taxi to take her to the embassy. None stopped except a private vehicle stopped, who only brought her back to the gate of her employer’s house. Forty-three-year-old Padma from Andhra Pradesh, India, is a new arrival at Kuwait City’s temporary shelter for women. But her trauma has endured for five years, through which her employers subjected her to emotional abuse, and most recently inhuman torture and sexual assault. At this point, the neighbour, returning home, noticed Rosella’s state and tried to intervene. The neighbour demanded to speak to Rosella and to ensure she was alright. The employer refused and tried to rush Rosella back into the house. The neighbour, worried about Rosella's safety, contacted the Social Work Society, and who along with Sandigan, helped Rosella out of the situation. They immediately brought the case to the attention of the police. “Because we knew they would try to send her back to the Philippines overnight, I stayed outside the house, all the time in touch with her on FB messenger,” says Chito. The day after the complaint was raised, the police took Rosella out of the home and brought the doctor and her husband (the legal sponsor) in for questioning. Rosella was left in the same room as her abuser during the criminal investigations procedure of the employers. “It was completely unacceptable. She was looking so scared and shaking when the employer walked in,” according to a social worker who intervened to remove her from the environment. It was only then that Rosella realised her ‘madam’ was not in the hospital for 10 months but in jail. 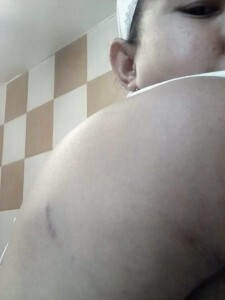 Since the husband was Rosella’s sponsor, and his name was on her visa, it was only after questioning that the social workers helping her also realised the madam in question was the same one whose brutal abuse of Vanessa, another domestic worker, made headlines a few short years ago. The Social Work Society was involved in the original case against the doctor. The pardon did not overturn the conviction, but only shortened the jail time. Yet, she was taken back to her old job and continued to work as a physician in the hospital. The General Attorney has filed cases of trafficking and sexual assault against the employers. The Humanitarian Legal Aid Foundation is fighting the case on Rosella’s behalf.